Cleo (Clinical Entry and Operations) Version 2 Released | Colabrativ, Inc.
We are pleased to announce that Cleo, Colabrativ’s Clinical Entry and Operations application, version 2, has been released. Cleo is the result of a close collaboration between The Clearity Foundation, a non-profit organization dedicated to “improving treatment options for ovarian cancer patients,” and Colabrativ, Inc.
Our goal for Cleo version 2 was to migrate Clearity’s patient medical record summaries from a Microsoft Access database to Cleo. In the process, we built medical record-specific objects to handle the specific needs of each class of medical record. To meet the foundation goals each medical record event has two display modes in a chronological list under the History tab. The “single” line display summaries the most important information, such as a CA-125 diagnostic procedure result, see Figure 1. The detailed display mode can be quickly accessed for any history event, by clicking on the Green “Open Panel” button on the left side of each history event box. History tab in Colabrativ’s Clinical Entry and Operations (Cleo) application displaying a fictitious ovarian cancer patient history in single line display mode. All of the personal information displayed in this figure is fictitious, and does not represent a real individual or their medical history. All history events have a common set of information about the event, including: date of the event, notes on the event and the source of the information. The source of the information can be: Medical Records, Pathology Reports, Imaging Records, Patient and Physician Communications. The source of the information can be uploaded into the history event, and are securely stored on an encrypted drive. Both display modes have access to any medical record documents that have been uploaded in a history event. In the “single” line mode a file icon can be clicked on to download the medical record file. In the detailed display mode the full name of the file is a download link to the file, see Figure 2. Multiple files can be uploaded for any history event. This is commonly done for surgical records and their associated pathology reports. A diagnostic procedure, such as the determination of the patient CA-125 level, used to monitor ovarian cancer patient response to therapy. In addition to the basic information described above, a Diagnostic Procedure history event has information on the test used, and its result. If there is evidence for any change in the patient’s status then that information is collected, along with who made the determination that the patient status had changed. A fictitious ovarian cancer patient Diagnostic Procedure history event shown in single line display mode (A) and detailed display mode (B) in Colabrativ’s Clinical Entry and Operations (Cleo) application. All of the personal information displayed in this figure is fictitious, and does not represent a real individual or their medical history. An Imaging Procedure history event has information on the procedure type, the Body Region imaged and the observations made from the images. Like Diagnostic Procedure events, an Imaging Procedures can have “Evidence For” any change in the patient’s status. Imaging Procedure history event shown in detailed display mode in Colabrativ’s Clinical Entry and Operations (Cleo) application. All of the personal information displayed in this figure is fictitious, and does not represent a real individual or their medical history. Both Biopsy and Centesis history events use the same panel structure. In addition to the basic information described above, these history events have information on the procedure used, and if there was evidence for any change in the patient’s status. In addition, the pathological analysis of any material collected, e.g. Cancer type, Histology, Stage and Grade can be entered. If the pathological analysis is the “Patient’s Staging Information Source”, then one can check this box and the patient’s Summary at the top of the history will be populated with this information. This option is also available for surgical events. 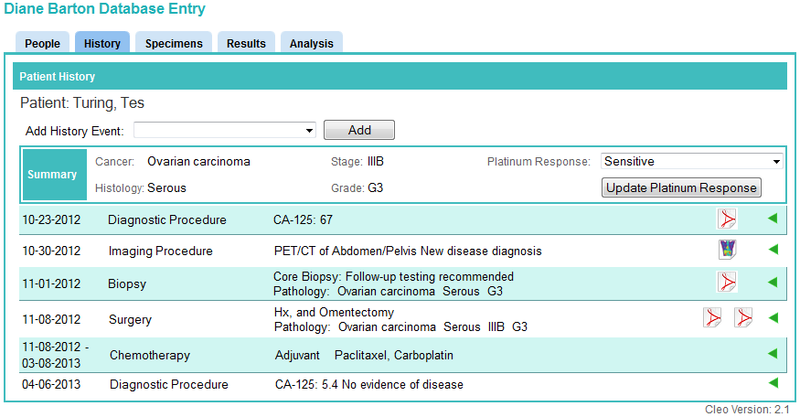 A fictitious ovarian cancer patient Summary and Biopsy history event shown in the detailed display mode in Colabrativ’s Clinical Entry and Operations (Cleo) application. All of the personal information displayed in this figure is fictitious, and does not represent a real individual or their medical history. Surgery history events are similar to Biopsies and Centeses, in that they all can have pathological analysis of any sample collected, e.g. Cancer type, Histology, Stage and Grade can be entered, and that information can be used to populate the patient’s Summary. They differ in that multiple procedures can be performed during a surgery, and they do not have “Evidence For” patient change in the status option. Surgery history event shown in the detailed display mode with an uploaded medical record and pathology report in Colabrativ’s Clinical Entry and Operations (Cleo) application. All of the personal information displayed in this figure is fictitious, and does not represent a real individual or their medical history. Chemotherapy events contain information on the chemotherapy agents used and the cycles of chemotherapy that were performed. A typical chemotherapy cycle is three consecutive weeks of treatment, followed by a week off. The cycle information is traced using the first to last cycle. This allows for changes in treatment, such as dropping an agent after the first cycle and replacing it with a new agent on the second cycle or when a drug dose is lowered. Some patients are enrolled in clinical trials, in which one may not know what treatment the patient received, due to the blind nature of the clinical trial. Chemotherapy history event shown in the detailed display mode in Colabrativ’s Clinical Entry and Operations (Cleo) application. All of the personal information displayed in this figure is fictitious, and does not represent a real individual or their medical history. The other history events that Colabrativ’s Clinical Entry and Operations (Cleo) application support are shown below. Deceased: A basic history event is used to record the date of death. Diagnosis: A basic history event is used to record patient information on their initial diagnosis. Hormone Therapy: The Chemotherapy structure is used to document Hormone Therapies. Last Contact: A basic history event is used to record the date of Last Contact. Lost to Follow Up: A basic history event is used to record the date the patient was lost to follow-up. Radiation: Currently a basic history event is being used record radiation treatments. We need to developed a Radiation specific class needed to support this history event. Status: A basic history event is used to record the patient status changes that are not covered by Biopsy, Diagnostic Procedure or Imaging Procedure. This entry was posted in Announcement and tagged Clinical, Enterprise, Healthcare. Bookmark the permalink.